Buying appliances for your home or office is kind of a big deal. After all, once you find the items you like you could end up spending hundreds if not thousands of dollars. This means that you should take the time to compare the prices and properties before shelling out any amount of money. So, knowing how to compare appliances before buying online is not only a good idea but it can also save you some time and cash in the end. When you’re ready to buy, the first place we recommend for country-wide service and delivery is The Home Depot. Before you start your search for the best home appliances online, you first need to decide what you need. Otherwise, you will be wasting a lot of time, and possibly a lot of money. Regardless of whether you are looking for stoves, refrigerators, dishwashers or something else, it’s important to know certain things prior to spending any amount of cash. Ask yourself what sort of attributes you desire, and don’t forget to consider things like measurements and power source. Online shopping is made to be convenient, but it is only a time-saving option if you have an idea of what you need before you begin. This is a good example: We know coffee is a necessity of our staff. We run a couple (yes 2!) Keurig coffee machines in our office. This is a good example, know what you need to shop around. Just because you plan to shop for home appliances online doesn’t mean that you shouldn’t also check out what a physical store has to offer. This is also a great way to lay hands on the items you like before you buy them. Being surprised by your purchase once you have spent your money is always a better plan. Aside from the cost of the appliance itself, the cost of shipping could be rather salty as well. For starters, try stores like Sears, Home Depot, and Lowes for the best prices. This is also a good time to compare prices as well, since some stores offer steep discounts depending on how you buy your appliances. We’d also include outdoor cooking products in this process as well like Grills. There’s many to choose from but sometimes it’s just easier to see one in the flesh before you make the decision. A little reminder here could save you some money down the track. Make sure you can source parts for your appliances. Yes that fancy Italian coffee machine that no-one has ever heard of may sound like a great deal if you’ve spoken to a sales person in-store, but if something goes wrong in a 2 year’s time and you’re out of warranty, then sourcing parts may prove very difficult. In some cases, it may be cheaper to buy a new appliance! Our source for appliance parts online is Appliance Parts Pros. If they don’t stock a part, then it may be worth reconsidering your choice. While you are at the store comparing attributes and prices for your purchase of online appliances, try to find out about any rebates, sales, or other incentives. Certain manufacturers offer steep savings when you buy online, while others prefer you to make your purchases in-store. On top of that, you could save even more money by choosing a slightly older model or one that has been discontinued. Many online merchants will even offer extra money off when you buy your items at a certain time, so take a moment to find out where the savings are before making your purchase. One drawback about purchasing online appliances is that the deals you find might not exist for very long. This means that it is always best for you to check on the prices you find as often as possible up until the time you decide to buy. Sales are always going on, regardless of whether the cost comes from a physical store or from an online source. Because home appliances are a major purchase and a necessity for most people, some merchants fluctuate prices to account for supply and demand. A wise consumer will not only understand this, but they will also consider it before spending any money. 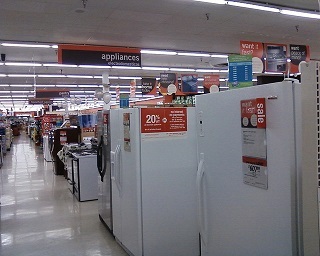 We list appliance prices across many online merchants and one of our favorite appliance retailers is Appliances Connection. They offer very competitive prices and stock most of the major brands and are well worth checking out. Remember that good home appliances are not that difficult to find if you know what you are doing and prepare accordingly. Also keep in mind that price is not always a clear sign of quality. Sometimes you can find what you need online at a reduced price and without having to opt for the most expensive model available.